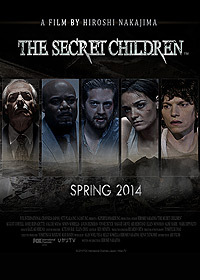 Secret Children (2014) - Sci-fi-central.com. Japan  2014  103m   Directed by: Hiroshi Nakajima.  Starring: Jamie Bernadette, Shaun Paul Piccinino, Ellen Michelle Monohan, David Jason Perez, A'Ali de Sousa, Elyse Cole, Ari Herstand, Eric Salazar, Andra Hayes, Simon Sorrells, Tina Manera, August Coryell, Louis B. Jack.  Music by: Kazuaki Hiruma. In the not so distant future, about 30,000 clones, also known as "The Secret Children," live harmoniously with the humans who created them more than 30 years ago. However, the lives of clones drastically change when a dictator named Bloomquist takes over the presidency and leads a campaign to extinguish them. The new regime instates a Clone Monitoring Committee to fulfill its goal to eradicate the clones until they are all destroyed.